Marinate the chicken pieces with three sliced onions, ginger & garlic (1 1/2 tbsp each), green chili (7 of the total qty used), coriander powder (1/2 of the total qty used), garam masala (2tsp), turmeric powder, chicken masala, bayleaf, curry leaves & salt. Keep it aside for 30 minutes. 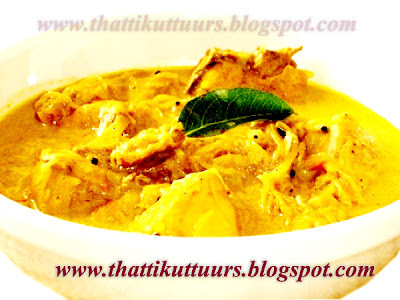 Cook the marinated chicken in medium thick coconut milk, till the chicken becomes tender. Add Shallots/ small onion, remaining portions of the sliced big onion, ginger & garlic, green chili and curry leaves. Saute it till the onion becomes soft. Add remaining coriander powder & garam masala. Fry it till the oil starts appearing. Add the sliced tomatoes. After five minutes add the cooked chicken along the gravy to this masala mix. Combine well. Add thick coconut milk and cook for 5-6 minutes.